The Anglican Diocesan Development and Relief Organization (ADDRO) in partnership with Comic Relief, a UK based funding Agency and in collaboration with the Ghana Health Service (GHS) has donated 344 bicycles to Community Health Volunteers (CHV) working in six districts in Northern, Upper East and Upper West Regions of Ghana to help fight malaria. The donation of the bicycles forms part of the Community-based Malaria Control Project (CMCP) being implemented by ADDRO and is intended to assist the volunteers move easily from home to home around their communities to pass out health information and education on the effective use of bed nets, lessons about how to curtail mosquito breading in the community, sensitizing community members to report to health facilities promptly to seek care and also to facilitate referrals. Volunteers are an important community resource for the success of many health projects. And even though volunteer usually work for free or without salary, their role in combating malaria cannot be underestimated. . For many years in Ghana, Community Health Volunteers have played a key role in facilitating engagement between communities and government as well as other development agencies seeking to bring health projects to their communities. They are instrumental in community mobilization and education. Despite the important role they play in fighting in promoting health however, there is hardly any regular funding for capacity for volunteers to promote and sustain their contributions to community development. In view of this, the Executive Director of ADDRO, Dr. Jacob Ayeebo, noted that “because the volunteers are not paid, we need to find ways of motivating them from time to time. Things like a bicycle is definitely useful for helping them move about easily to carry out their duties. Besides, we could use occasions like Christmas and other festive seasons to present token gifts to volunteers. In this way you can be sure that most of them will feel motivated to continue the harder work they do”. 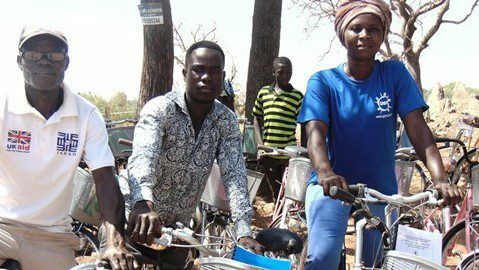 The District Director of Health Services for Nabdam, Madam Meri Seidu said the support in bicycles and capacity building for volunteers in her two Sub-districts constitutes a significant contribution to health care delivery in the district. “In order for us to reach the community members and provide the services we always need our volunteers but our motivations are always woefully inadequate for them”. She lamented. Madam Meri noted that even though the support from ADDRO does not cover the entire district it gives her the opportunity to leverage resources from other sources to assist volunteers in the rest of the district. She made a passionate appeal to ADDRO to consider enrolling additional facilities under their project. “I am writing a letter to them to see how they can come in to assist the district with one or two things because we really need them” she noted. During a ceremony to hand over some of the bicycles at Sakote in the Nabdam District in the Upper East Region, the District Chief Executive Hon.Mrs Agnes Anamoo thanked ADDRO for the support noting “As someone who has once worked as a volunteer I know the importance of the bicycles you have just presented to the volunteers and I want to thank you for the assistance”. She further pledged her support for the project and said she will use her engagements with the communities to encourage them to utilize the support to derive maximum benefit in malaria control. A beneficiary, Mr. Simbil Emmanuel on behalf of the volunteers expressed his gratitude to ADDRO for the support and promised to work hard despites the challenges in the work, including loss of time for their personal farm works. Mr. Prince Imoro Awimba, the Project Coordinator of the Community-based Malaria Control Project said ADDRO was confident that the volunteers will use the knowledge they acquire from the trainings supported by ADDRO and the support of the bicycles to work for their communities. He disclosed that ADDRO was not just making a one-time donation of the bicycles but it also has a plan replacing all major parts of the bicycle for the four years period of the project cycle. “We are not only giving them the bicycles but will make efforts to also help them to replace all major parts of the bicycles as and when the need arises so that they can continue to use them for a little much longer”. ADDRO is the development arm of the Anglican Church, Diocese of Tamale, Ghana, with its national office situated in Bolgatanga. With programmes on Agriculture, Food Security and Sustainable Livelihoods, Health, Environment, Governance and Peace building, Disaster and Relief, and Water and Sanitation. ADDRO is currently operating in 7 of the ten regions of Ghana. The Community-based Malaria Control Project aims to contribute to reduction in malaria related morbidity and mortality.